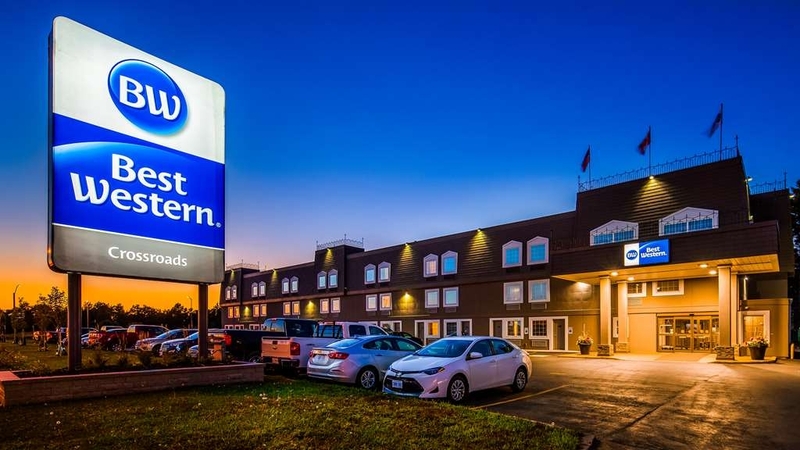 El Best Western Thunder Bay Crossroads se encuentra en el centro de Thunder Bay. Venga y disfrute de las mejores atracciónes turísticas cerca de nuestro hotel. Precios bajos garantizados y ofertas exclusivas. REALICE SU RESERVA DIRECTAMENTE Y AHORRE. Póngase en contacto con el hotel o visite wwwbestwestern. com. 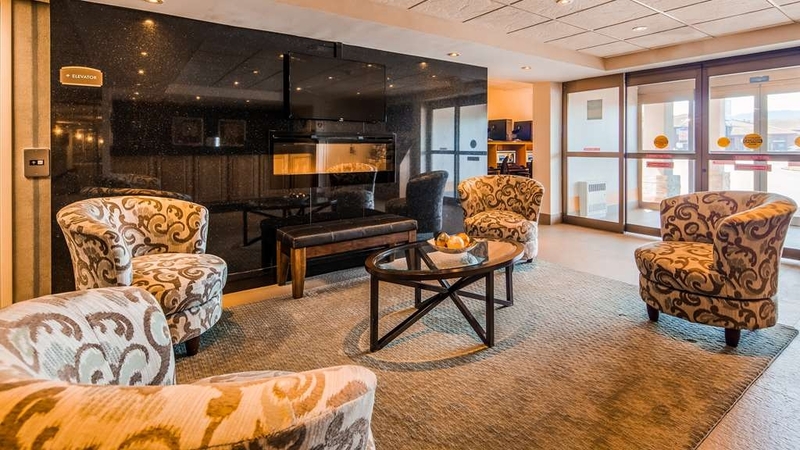 Tras un largo día de actividades al aire libre, lo que realmente le apetece es disfrutar de todo tipo de lujosos servicios y eso es precisamente lo que ofrece este hotel de Thunder Bay. El hecho de que un hotel se encuentre situado en el aeropuerto de Thunder Bay no tiene que significar necesariamente que esté alejado de las atracciones por las que se encuentra visitando la región de Ontario. 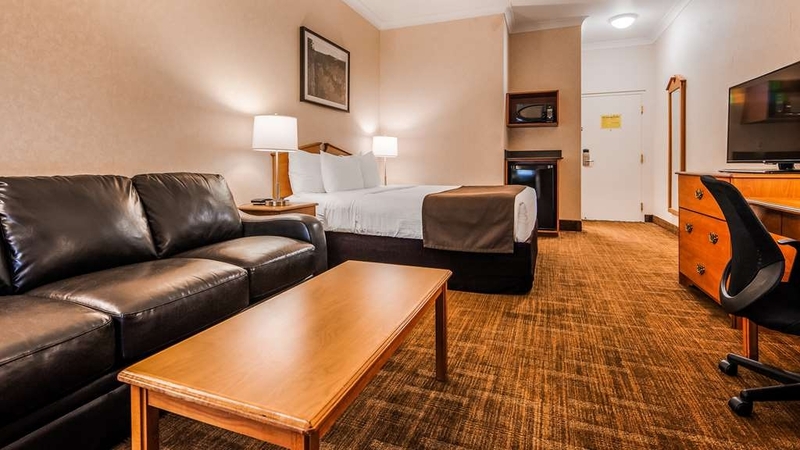 El Best Western® Thunder Bay Crossroads ofrece a los huéspedes una fantástica ubicación, unas tarifas muy asequibles y un corto trayecto en auto hasta las principales actividades de recreo de la zona. Al estar situados junto a la carretera, nuestros huéspedes estarán en todo momento a un golpe de volante de numerosas aventuras. ¿Comodidad, limpieza y unas asequibles tarifas? Por supuesto. Sin embargo, también podrá encontrar mucho más. El hotel está situado en las inmediaciones del aeropuerto de Thunder Bay, lo que permitirá a los huéspedes en viaje de negocios disfrutar de un fantástico descanso antes de tomar un vuelo a primera hora. No olvide disfrutar de nuestro desayuno gratuito antes de salir del hotel. Este hotel de Thunder Bay ofrece montañas de pasteles, toneladas de fruta fresca, interminables raciones de cereales con yogur y, por supuesto café 100% Arabica y jugos fríos. El Parque Histórico Fort William es un lugar de obligada visita. La pesca y la caza son dos de las actividades que atraen a un mayor número de visitantes a esta zona. Durante su estancia podrá acceder asimismo a los principales espacios de caza y pesca locales para hacer la captura de su vida. Los huéspedes de este hotel de Thunder Bay que se encuentren de visita enla ciudad para disfrutar de la naturaleza local habrán hecho bingo con su elección. Este hotel se encuentra situado asimismo a poca distancia de numerosos centros médicos para todos aquellos huéspedes que tengan que visitar a familiares o amigos. Este hotel de Thunder Bay es igualmente uno de los lugares preferidos por los viajeros de negocios que tengan previsto visitar Bombardier, las tribus First Nations, Shoppers Drug Mart, Hydro One o el Department of National Defense. Los viajes de negocios pueden resultar agotadores, así que ¿por qué no añadir algo de diversión a su estancia? Nuestros huéspedes podrán encargarse de sus asuntos de negocios, dejarse mimar por nuestra gran variedad de servicios y visitar las numerosas opciones comerciales y gastronómicas de la zona. Reserve su habitación en el Best Western® Thunder Bay Crossroads y saque el máximo partido a sus vacaciones. Nuestra planta ejecutiva no admite mascotas, a excepción de los perros de servicio para invidentes. No ofrecemos paquetes Estacionamiento y vuelo Disfrute de su estancia en nuestro hotel. Very clean hotel, easy check in and check out, friendly staff, breakfast provides large selection of food choices, room was very spacious, bed comfortable, we prefer to stay at this hotel.Highly recommended. "Small enough to care and big enough satisfy!" Once again looked after our needs in a caring fashion! Enjoyed our stay and was completely satisfied! The breakfast has a great assortment with a caring person to aid you on your selections. Close to the airport for easy access - provided free by the way! I wanted to pay cash or debit visa for my deposit but was told by the girl at the front desk they do not do that she then proceeded to ask me if I wanted to cancel my reservation and would not even try to come up with an alternate payment plan. She was rude. I don't like to use my credit cards for this as it takes them up to a week to put the money back on my card. The next guy I dealt with was able to help me out. (He was a little nicer) Thou I had to call someone to try and fix it first. I don't mind paying for a deposit and would gladly do it with my debit card and have it replaced the next morning. I have done this at other hotels with no problems. Thank you for staying with us. Unfortunately we require a valid credit card to check in. We do accept deposits. Guests may pay via cash or debit on check-out. Credit card holds are released by us upon departure, although the banks may take a few days. I am truly sorry, if any of our staff appeared rude, by enforcing this requirement. Staying at the Best Western is always a great stay. The rooms are comfortable and clean. The internet works flawlessly and at high speed. The best part is the the continental breakfast, there is a good selection that makes a great start to the day. Booking n was very quick and I was upgraded to a King room. The front desk staff and I are have met a number of times in my previous stays and make me feel like I'm home. The rooms were very clean and nicely appointed with a very comfortable bed and firm pillows. The tv stations have just been switched over to HD giving a very clear picture and sound. The room includes a safe if required for securing valuables. There is a coffee maker in the rom and another selectable coffee maker by the front desk that dispenses coffee, mocha, not chocolate and so on. A nice bonus. There is no restaurant on site, but there are a number of restaurants and bars within easy walking distance as well as a shopping mall just over the highway, with a new LCBO with excellent selection. There is also a Creek with river bank walking trails about a quarter mile away. One of my favourite smaller hotels in the city to stay at. Every year we go fishing in northern Ontario we spend our first night at this motel. Crossing the border at Pigeon River this is a very convenient spot to spend the night. There are many restaurants conveniently located. They have a very nice breakfast available. The rooms are always clean and they have coffee available in the lobby 24/7. Will return this year again. Thank you for choosing the Best Western, Thunder Bay Crossroads. We are pleased that you enjoy staying at our hotel, and hope that you will return, soon. "medical stay in t. bay"
excellent stay-rooms very comfortable.TV guide on screen in room not like @ home for channel selection. Weather was terrible in the city (snowfall). The parking lot was cleared rapidly(twice) during our stay at BW Xroads. This is a well managed hotel. The staff are friendly. I had the pleasure of chatting with a few staff members who were very helpful and made my stay that much more enjoyable. Location is close to amenities and located right off the highway for ease of access. We have been loyal customers at Crossroads for at least a decade . It's our hotel of choice when we visit the city. It is economical, clean and allows our pet when we have to travel with him. The hotel location is optimal for most of our needs close to our son, close to the airport and with the Highway being only yards away easy to travel anywhere in the city. As a bonus for those with back problems the beds are very comfortable. As per usual, Best Western Thunder Bay Crossroads provided a comfortable stop-over. Free parking and a nice breakfast in the morning. Staff was helpful and friendly. Internet worked flawlessly. Highly recommend. This is by far my favourite hotel when driving across northwestern Ontario. The location is perfect for doing anything in the city. There is a gas station exceptionally close and a Pizza Hut is within walking distance. The hotel is so comfortable with abundant parking. The beds are terrific, and the morning breakfast is huge. Access to Arthur street is immediate yet the hotel is incredibly quiet; access to highway 17 is easy and only minutes away. Definitely my go-to while in Thunder Bay! Great hotel, staff were friendly and very helpful. Recommended an awesome restaurant, (best Chinese we ever had!) . Drive up our door to unload, spacious room and great amenities. If ever we go through again would definitely stay there again. Thanks guys for the wonderful memories! Thank you for staying with us. I am so pleased that you enjoyed your stay, and had a great meal in the area. "Good location- close to airport"
Good clean well looked after hotel. Only minutes to airport. You might want to ask for a room on the east side so you are not woken by planes taking off in morning! Service fast and friendly. Good hot breakfast included. 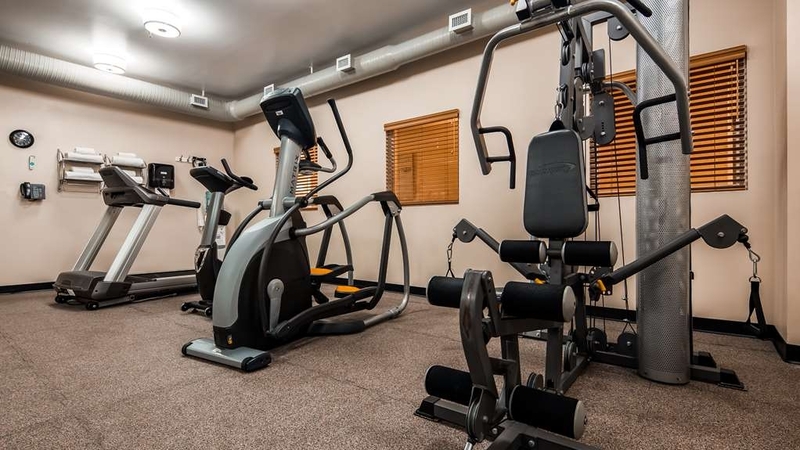 Fitness room but no pool.Overall good value for price! The hotel is very clean, rooms are quiet, the bed was very comfortable, the staff is very professional, polite and efficient. The breakfast could be updated slightly (just a traditional complimentary breakfast). 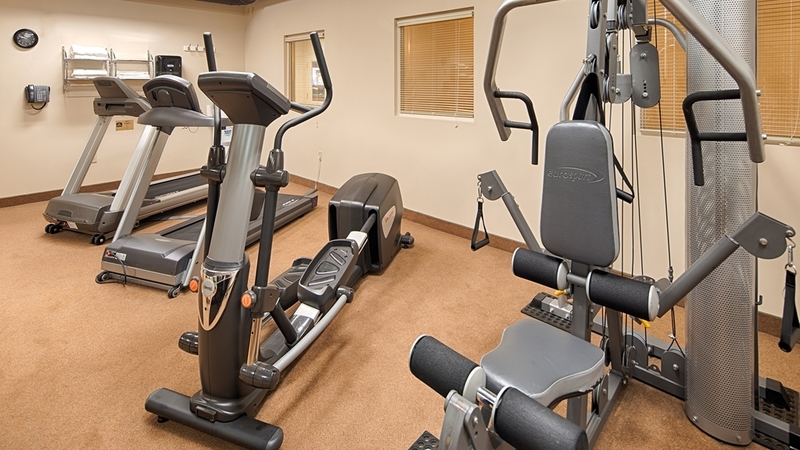 The fitness centre is satisfactory, minir improvements and it would be great for a hotel. Definitely would stay here again and again. I have spent several days each month in Thunder Bay for years now on business. Crossroads BW has always been consistent, clean, and reliable. Staff are friendly, and like family. I know what I am getting before I go. "1st visit from Wisconsin "
While passing through Thunder Bay the Best Western Hotel caught our attention. Never had a bad experience staying at any before. Checking in was easy and staff was very friendly and help full on restaurants info etc. our room was ground level and was able to back up and park right at your door. Big bonus, no need for a cart and for the elderly. The WiFi worked excellent, the Room was very clean, shower was very clean and water pressure excellent. Little problem getting tv remote to work but front desk attendant came right away to solve a simple battery replacement. Continental breakfast was good, cheese omelets, sausages, waffles, eggs, fruit, etc. it's all you need and was very nicely displayed. Very maintained Hotel and Easy to find while traveling. 2 thumbs up and great job. "Great spot for the Airport! " I am pleased that you enjoyed your stay with us. We all hope that you will return soon. Thank you for choosing the Thunder Bay Crossroads. I am pleased that you enjoyed your stay, and hope that you will return, soon. "Great location for cross country travel"
Perfect location while travelling. Close to everything. Close to airport and TransCanada. Very pleasant staff. Helpful and knowledgeable. Even have microwave dinners onsight if in a rush. Breakfast is excellent. We stayed here on our way east. Check in was convenient and easy. Prices are comparable to other hotels in the area. The hotel itself is very clean and modern. The bed was very comfortable and the room clean. Complimentary breakfast was included and there was many delicious options that we enjoyed before going back to travel. My family stays here on their way out west and we will definitely book again on our way through Thunder Bay in the future! Spent two nights here, very clean. Great breakfast, room was roomy, nice bathroom set up. It was nice to be able to park outside our door to easily carry luggage in to room the location was on outskirts of all main travelling roads in Thunder Bay .Another great Best Wester Hotel. Thank you for staying with us. We hope that you will return soon. "Great spot to rest your head." We stayed here recently to make catching an early morning flight a little easier to accomplish. Very close to the airport (perhaps a kilometre), also to many restaurants and variety stores. Most needs can be met within a very comfortable walking distance. We had a double queen, room was very spacious and clean. Work desk and free wifi (good, strong signal) are provided, as is a decent hot breakfast at no additional charge. Beds were very comfortable, good linens and amenities. Price seemed fair. Thank you for staying with us. I am pleased that you enjoyed your stay. First time I have been back to this hotel in 3 years. Desk manager still recognized me as soon as I walked in. Great start.Check in was smooth and error free. Room was still as clean and in the same condition as it was 3 years ago. No visible deterioration. Nice to see.Bed was very comfortable as were the desk chair and sofa. Bathroom was clean and everything worked well.Internet was stable and fairly fast. 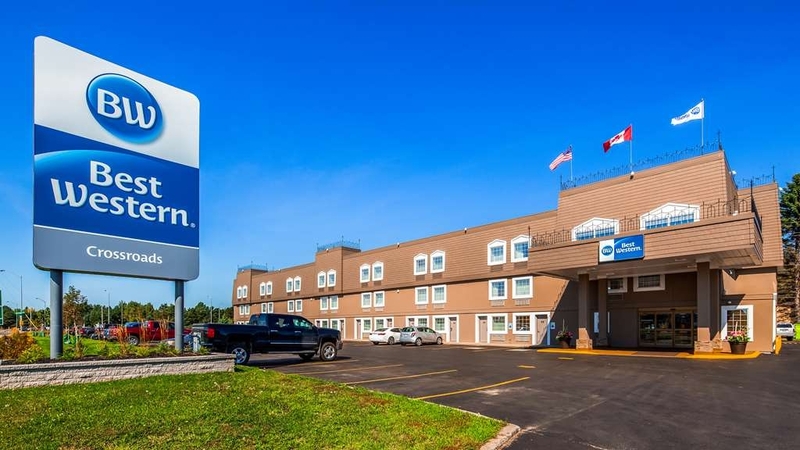 Lots of free parking and close to the airport and other amenities.Still my go to hotel in Thunder Bay!!! Rooms are good and include microwave and fridge (ours even had a small freezer). Breakfast has lots of choices, too. Just wish the beds weren't so soft and mushy. Would like a firmer mattress for sure. Very clean hotel, friendly staff, excellent breakfast selections and service, rooms very clean and beds comfortable. 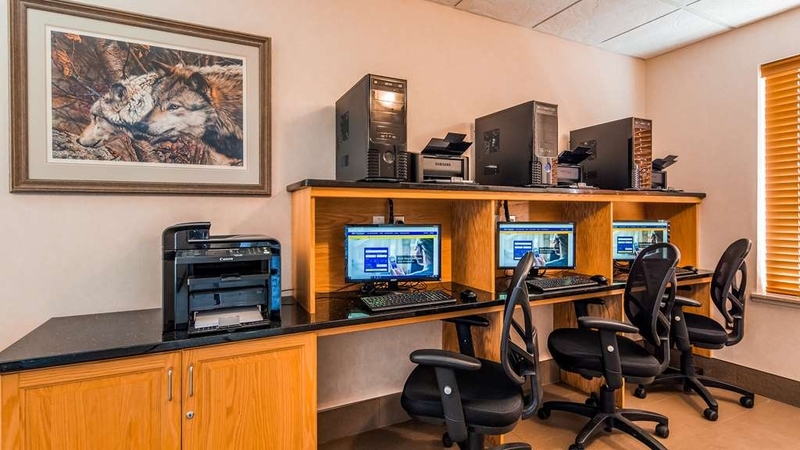 great location.quick and easy check in and check out process.convenient refreshment area (coffee, tea and hot chocolate) with in room coffee machines and refrigerator. "Nice hotel, would stay again"
Really nice hotel but a bit on the expensive side. Stayed one night while heading to the Maritimes from Edmonton. Got in late (around 11pm). Room was so spacious, had a king bed and could easily fit another queen. This was perfect as out 1 year old had been in the car for about 11hrs that day. He had a lot of space to crawl and walk around after the long car ride. The room had a bathtub ( I note this because the hotel we stayed in the night previous was a walk in shower only). The tub was spotless… seriously, not even water spots on the tub fixtures. The hotel has complimentary breakfast and a high chair (the cushion was torn in several areas) The little one didn't care though, he loved the yogurt and waffles. This hotel does not have a pool but given how late we got in and early we left, we wouldn't have had time . Would stay here again if doing another road trip. Thank you for staying with us. I am pleased that you enjoyed your stay. I will have a look at that high chair with a torn seat and either replace it or get it repaired. Our rates do fluxuate depending on the demand in the city. We are in a very season, and subsequently our rates are higher now. We do check our competitors rates daily to ensure that we remain competitive. "Great value, clean and friendly, accommodating staff"
I stayed here with my husband for 6 nights with our dog. This hotel is very clean and quiet if you stay in the back rooms. Last time I was here the wifi sucked. It was clearly not working then and has been fixed as there were no issues whatsoever with it. The staff are extremely friendly and will bend over backwards to help you. I actually didn't want a ground floor room even though we had our toy poodle with us and they moved us no problem. The free breakfast is really good with ample choices and quantities of food. The beds are super comfortable and my husband is quite picky. He was quite impressed with this place for the money and so am I. I wouldn't hesitate to come back to this hotel again. You can walk to restaurants and lovely residential area with walking/bike path beside it for walking too. Gym facility although small is a bonus! Thank you for returning to the Crossroads. We appreciate your kind comments and hope that you will return soon. "Three nights at Best WEstern Crossroads just outside Thunder Bay, Ontario"
Thank you for taking the time to post a review. I would have preferred if you had spoken to me directly. Everyone is entitled to an opinion, and I am glad that most of our guest like our hotel. I will investigate your concerns. I was here for 3 nights in May,2018. The rooms were average and had been updated. The location was good as it was close to the airport. The breakfast was fine with a decent selection.The staff were friendly and went the extra mile. Thank you for staying with us. We hope that you will return, soon. Stayed one night at this Best Western and I had enough. My room was on the first floor facing the busy road...super loud at night. Our room was older and outdated. I've stayed in better best western hotels... I wouldn't return. We were there for the Thunder Bay vintage car rally-staff did everything possible to make our accommodations clean and comfortable. Food was great, location perfect to see the sights. Great for families! Thank you! Everything was great! It was all good and definitely great. Wow. What a time. Great breakfast. Great beds. Great fun. You won't be disappointed. I would live there if I could. Alas, I had to go home after only a short stay to visit family in Northern Ontario. Thank you soooooooooooooooooooooooooooooooooooooooooooooooooooooooooooooooo much. Love this place!!! They treat me like family!! I stay here often..... highly recommend....If your travelling with a pet, you wanna stay here. When I stay here alone I feel very safe to go for a walk around the area. Lots of good places to eat within walking distance. We always stay here each year for the special Olympics bowling tournament with our son. The bowling alley is just across the street from the hotel and so is convenient. The morning breakfast is always good and the rooms are well maintained with friendly staff . My go-to for business in TB. I have visited many times over the years. Always and excellent experience and the breakfast is quite decent with a change-up every day. They pay the cab to, and from, the airport..a nice touch! I like this hotel. I choose to stay at these brands of hotels quite often for business. I have stayed at this hotel a number of times and it is always a quality experience. The staff are friendly and accommodating, the breakfast is good and the rooms are clean. I would recommend staying here for business. We got to the hotel late that night and the front desk staff was very accommodating. They made us feel very welcomed and ensured that our stay would be nice and it was! If you are looking for a hotel after a very long days drive like we were then this is the place for you. Many thanks to Norman for his kindness. Enjoyed the variety in the complimentary breakfast. Conveniently located close to the airport, and clean. Friendly, hospitable staff. Easy access to restaurants. Thank you for staying with us. I am pleased that you enjoyed your visit. The rooms were clean and staff very friendly. We met Norman he was so great to us and made us feel so welcome. Thanks Norman! There is a free breakfast every morning and it wasn't just coffee and sweets. Stayed twice. Once was cleaner than the other but it was never dirty. The bottom floor has the direct outside entrance so it is very convenient for us pet owners. Close to everything. Staff is nice. The free hot Breakfast is better than average. Would definitely stay again and recommend. "Nice place to stay for a short trip"
I like to stay at this Best Western hotel because it is close to the edge of the city, close to the airport, close to restaurants, I can call and ask for a specific area of the hotel I'd like my room to be located at, and it's a good price. My go to place in Thunder Bay when I have my dog with me. Reasonable rate and only 15$ pet fee. Also ground floor, room to the parking lot is handy for the dog. Clean hotel, friendly staff , close to restaurants. Order your airport shuttle earlier than you need it, They use taxis and there is a shortage of them in the city so they can be late. All good except for the room 122 that had dog hair all over the 2nd bed....they changed us for 124...all ok. Breakfast was excellent helpful staff...good sleep...asked for a quiet room and was real pleased with it. "Up to its usual above par"
We have stayed at this location many times over the years and they have always been accommodating to our needs. Our little dog is always welcome here. and best of all the beds are extremely comfortable. 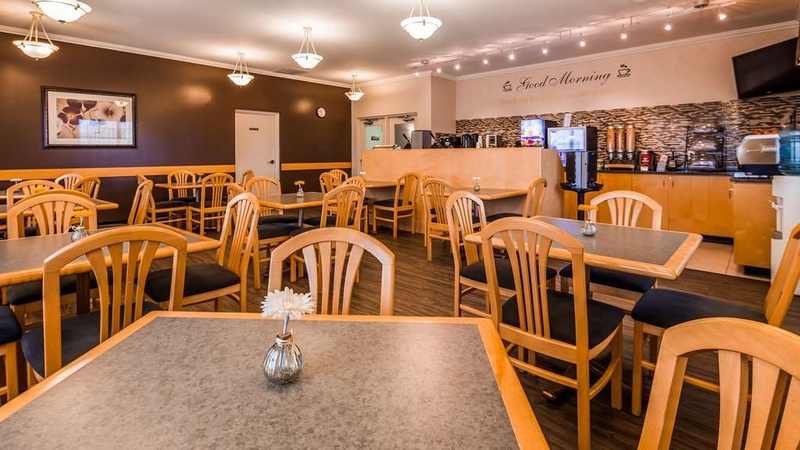 "Our 1st choice of Hotel in TBAY"
B/W Crossroads is a clean, quiet & comfortable Hotel. All the employees (front desk, maids & breakfast hostess) are always friendly, helpful & professional. The qualify of the "Rewards Program", B/W Crossroads and the staff are why we try to always stay there. If there are no available rooms, we'll stay at B/W Norwester, which also provides us with quality service! "If you want to sleep...dont stay here!" My room on the third floor away from the elevator was perfect until i noticed the Arthur Street traffic~it didn't stop. The room was large a outdated but good enough for 1 night. The shower was not cleaned properly as there was residual hair on the shower walls~ housekeeping could be heard early in the morning wondering if rooms were checking out....there is a gym as well as breakfast room on the 3rd floor. Thank you for taking the time to write a review. The traffic on Arthur Street can be very busy at times. For those light sleepers, I would recommend rooms at the back of the hotel. We are currently doing a number of upgrades to the hotel. Carpeting for the hallways is on order, and should go in next month. All the furniture on the 3rd floor will also be replaced this year. We have recently changed all of the hotel room door locks with the most up to date and reliable available. We have also replaced all of the tub surrounds on the 2nd floor, all televisions, 3rd floor in-room lighting, all telephones and lobby tile. We have started on a landscaping project and will complete it in the spring. We are also scheduled to re-do our entrance way, replace all the pictures in the building as well as the flooring in the breakfast room and fitness area. We always stay here. No pool - no kids running around. Excellent breakfast - close to airport.- clean - updated - close to restaurants , Reasonable room prices - Good access to the city yet on the edge. "The usual Best Western comforts"
This is a nice hotel close to the Airport and the Trans-Canada if you're driving. It has main floor interior/exterior entrances (always a bonus feature) but an elevator if you're staying on an upper level. The room was clean and reasonably spacious. Hot breakfast options are available beyond the usual continental fare and after a month on the road and eating many complimentary breakfasts along the way, we thought it was far above average. It's on a busy thoroughfare close to many malls and there are a number of fast food options nearby. If you're interested in upper scale dining, it appeared that most of the nicer restaurants are downtown, perhaps 7-8 Kms away. All things considered, we thought that this place was very good value for the buck. 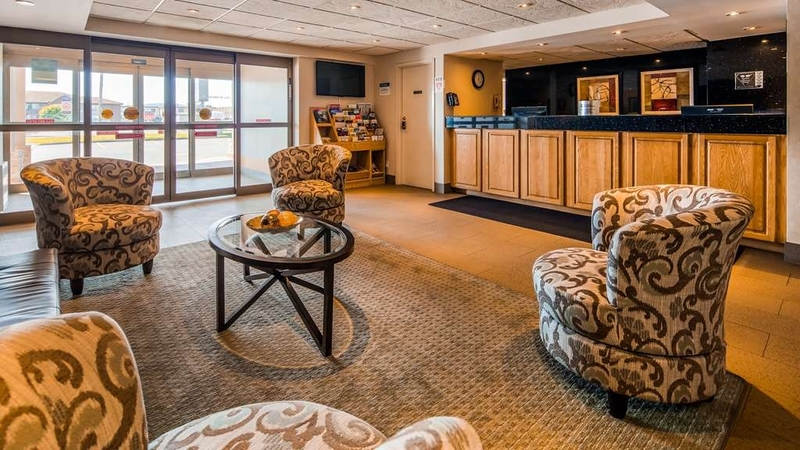 The BW Crossroad is well positioned for those with early flight departures from Thunder Bay International Airport, providing the right amount of amenities for a reasonable price. Staff are friendly and the rooms are clean, functional and modern! As always the room was clean and quiet. We parked right outside our room which was nice as were were driving a 26' Uhaul. It is so nice to have breakfast included when staying at a BW. They always have a nice variety and you can take a coffee and some fruit to go. Awesome facility....Great food, great rooms and Alex at the front desk was most helpful, pleasant and accommodating.Central location and close to a lot of amenities. I would definitely stay here again if I were going through Thunder Bay. Highly recommend this hotel. Nice & clean...very pleasant experience. Breakfast included which was lovely. Excellent stay. Clean room. Breakfast was decent. Friendly, hospitable staff. I would stay here again as I enjoy the complimentary breakfast and the hotel location is close to many amenities. The parking lot entrance and exit is a bit of trouble but with the help of one of the front desk personnel we were able to circumvent the issues during rush hour. "A Best Western you can Count On!" Well it was a last minute flight back home to Thunder Bay, and a late arrival to the city. 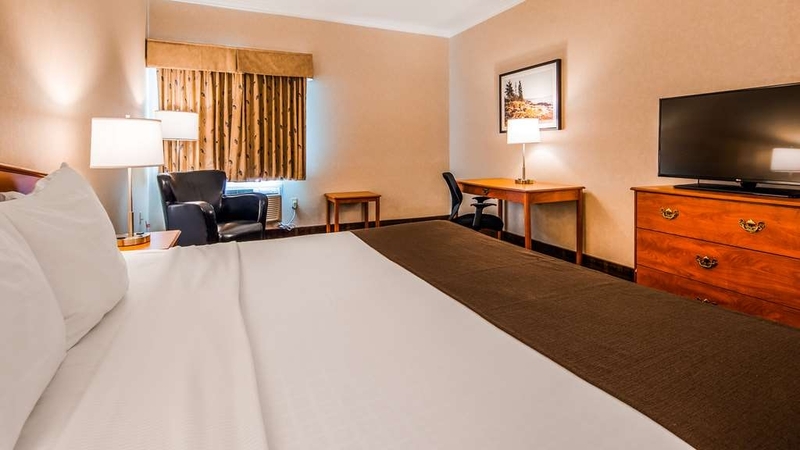 My husband and I opted to stay at this Best Western as it is located on the corner of the Expressway and Arthur Street instead of waking up my elderly parents. After collecting our luggage at the airport, it was a short five minute taxi ride to the hotel. We were pleased that the BW covered the cost of our taxi ride from the airport to the hotel which was nice! By the time we checked in and got to our room it was after 1am; I did take some pictures before we went to sleep. The room was clean, quiet and comfortable as expected at a BW. We enjoyed the selection of the free breakfast and the hotel even covered the cost of our taxi back to the airport to pick up our rental car. Thanks Best Western! Always a great stay and you'll always go back. The rooms are clean modern and you always get a good nights sleep! No matter what the reason for your stay , It is always a pleasure to stay in this friendly hotel! 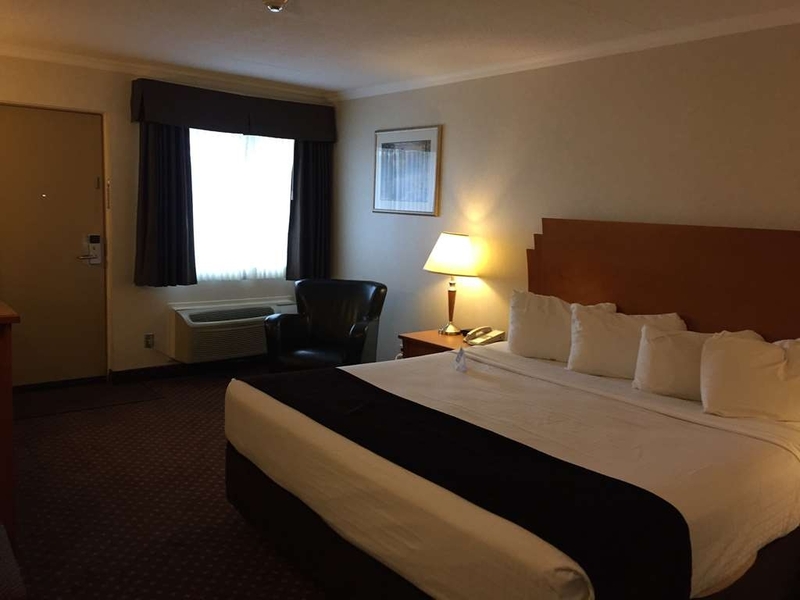 "Best Western Crossroads, Thunder Bay, ON"
Best Western Crossroads, Thunder Bay, ON, we have always experienced excellent service and friendly outgoing staff. Breakfast included, excellent choices and service. Excellent location and very clean. This hotel was at a very good location for leaving in the morning. Close to the airport for easy access for any flights. The breakfast area was clean and well supplied. Staff at the front counter very very helpful. I appreciated the extra efforts the front counter evening staff went above and beyond my expectations. The exercise room looked great but just no time. I will visit again when in the area if needed. Great service at front desk upon my arrival . Clean comfy room and tasty breakfast . Very clean inside and out .Plenty of good parking spaces . Driving across country and even got oil changed next door ! "Front desk clerks need improvement"
After a very long third day in a row traveling, we didn't get anything near friendly from the two clerks, no greetings, barely looking up from their computer screens every time we walked by them, no friendly suggestions for eating etc, otherwise the room was clean and comfortable but the clerks spoiled our visit, including in the morning trying to make friendly conversation with them. "Drive up to Your Room"
Canada's 150th I decided to drive across Canada to visit old friends. I got into ThunderBay quite late and was hungry. The night clerk gave me directions to a restaurant close by to eat. And then my room had an exterior entrance which was extremely handy to move my luggage in and out. Great place to stay. Thanks Best Western. Loved the free 24 hour coffee/tea/hot chocolate machine. Nice to have a fresh cup of coffee when I wanted. Nice clean hotel, good continental breakfast with hot eggs, bacon, waffles, pastries, and other typical items. Good selection. stop to sleep at the Best Western and when i got out of my van i lost my footing , pushed the door closed as i was falling and locked myself out of my van . The Guys at the front desk took matters in to making sure i get back into my van ASAP .thanks Guys for all the extra work ill never forget it. "Good value, excellent breakfast "
Well maintained clean room. Comfortable beds and lots of pillows. Easy to find as you travel thru Thunder Bay. Lots of restaurants close by as well as shopping. fitness Centre inside hotel. Quiet no hallway. Noise. It was a one night stay on a cross country road trip. We had a room on the first floor with both interior and exterior access. Everything about this stay was great -- clean room, good shower pressure, and great breakfast. For the Price I expected a swimming pool and hot tub. Was very disappointed. Mattress was not comfortable and needs to be replaced. Carpet in room was due for a steam cleaning. Did have a nice hot breakfast though. Thank you for staying with us, and for posting a review. I am sorry that you were not happier with our hotel. We try to keep our rates competitive with our local competition. I do check the rates of our neighbouring hotels daily and make adjustments to our rate. Rates tend to be higher when the city is busier and the demand is high. We do change our mattresses on a regular basis. I will have the room you occupied checked to and have that mattress replaces on our next shipment, if needed. "My Thunder Bay Go to"
"Great experience at BW Crossroad in Thunder-Bay"
We arrived the first time in the pouring rain and found the hotel difficult to get to. It was much easier coming from the west. Our stay was pleasant and the only negative about the hotel was the lack of counter space in the bathroom. Not nearly enough space for 2 people. There were many dining places within walking distance. Can't complain about anything with this hotel. staff was courteous and rooms were very clean. breakfast was very good and has an elevator which is very nice to have. all in all will always stay there when visiting Thunder Bay. "Well maintained property in a decent location"
Looks like an older property, but rooms were clean and the bed comfortable. Good staff and decent breakfast. Convenient location. Easy booking, check in and check out. Worked well for our short visit. I would recommend. "WiFi was the highlight of the stay"
Tbay being booked solid on the weekend, we were lucky to get a room! Was expensive, although that seems to be the going rate this season. The computers were acting up at check-in so took a little bit longer but Tammy was still friendly and courteous. The room was clean but had a funky smell in the doorway/bathroom area. Couldn't quite put my finger on it. There was a dog staying in the room next door to us so I chalked up the smell to being a pet smell from a previous guest, or else it was an attempt to cover up a smell. Thank goodness it was only by the door and not in the bed area. 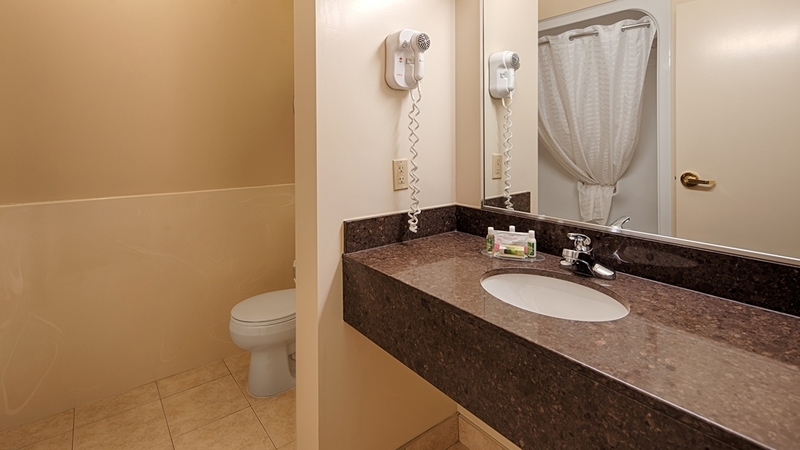 I like the separate sink area so that one can brush teeth while another showers. Lots of room in the room. Bed was super comfy and pillows were good. Fridge and microwave in the room. No freezer though so couldn't freeze the cooler pack thingy. Not a huge deal. Nice big deep bathtub. Lots of hot water. Breakfast room too small and cramped. No flow for food items. Other guests were like vultures and pushy (not the hotels fault). The breakfast staff did a good job of trying to keep up with said vultures. I wonder if the vultures were trying to eat enough ham slices to justify the cost of the room? haha I jest. Air conditioner was in good working order. The Internet was the best I've ever had in a hotel. The. Best. Seriously. Thank you for that. Check out was a bit awkward with Anastasia but it worked out and all was well in the end. "Good but not a BWplus." Nice property, lack of adequate seating for breakfast, no guest laundry. Had to drive to laundromat. Beds comfortable. Easy 1-2 block walk to multiple dining options. Try Monsoon for great Indian food. The property is nice enough and I did get a good night sleep. I received no recognition, however, as a Best Western Rewards member. Also the front desk failed to share that the doors are locked after 11 PM and that it would take 10 minutes to gain entry. Arriving from the west coast at about 10:30 PM, I was not ready to go to bed. I was surprised at the difficulty I had gaining entry when I returned from my walk. A number of local hotels were robbed during the late night hours a few years ago. This forced most hotels of our size or smaller to lock their doors during the quiet hours. We normally post a sign directing guests to the door bell, and to advise that current guests can always access the hotel through our side entrances ( with the room key). I will follow up on the signage, and apologize for the inconvenience. "Thunder Bay Best Western Crossroads"
Very friendly staff that make you feel at home. Rooms are clean and beds are comfortable. I would definitely recommend this place to anyone that asks where to stay inThunder Bay. For some reason the internet reception was very poor, had to use my data plan. Prices are very good. The hotel staff were friendly and helpful. We were extremely satisfied. The rooms were clean and comfortable. The staff was patient and answered all of our questions. Provided information and gave us excellent directions. We stayed 4 days and 3 nights. Rooms were clean and the staff were all very friendly. Everyone greeted you and the staff that were on duty for the continental breakfast were awesome. They said Good morning, assisted you if you needed help, which I did making waffles. They constantly wiped up any messes of syrup, etc. and anything anyone left behind. They also refilled everything and everything was nice and hot. The staff was friendly and efficient. The room was clean, the bed was comfortable, what more does a guy need? The breakfast had a choice of waffles or eggs and ham (or both). Coffee was on 24/7 in the lobby. I have no complaints, and would most certainly recommend this hotel. We have stayed at this location many times over the past few years for several reasons. It is close to the airport where we drop off and pick up our children when they visit It is fairly close to our son's apartment and allows us easy access to the city bypass which we use to get across town quickly and easily when we need to do so. Also they accept pets at this location when we travel with our small dog. I am sorry to hear that you had a problem with the toilet in your room. Although we do have "Green Friendly" low flow toilets in our rooms, under normal circumstances, they normally function well. I have the one in the room you occupied checked by maintenance We do have a number of upgrade projects in the works. We had hoped to complete a large landscaping project at the front of the building this summer, but are held up by Ministry of Transportation approvals ( they control the grassed area in front of the hotel). We will soon be replacing all of the hall carpets, the breakfast room flooring, as well as that in the fitness room. We will also be replacing all of the furniture on the 3rd floor, as well as all the pictures in the building. 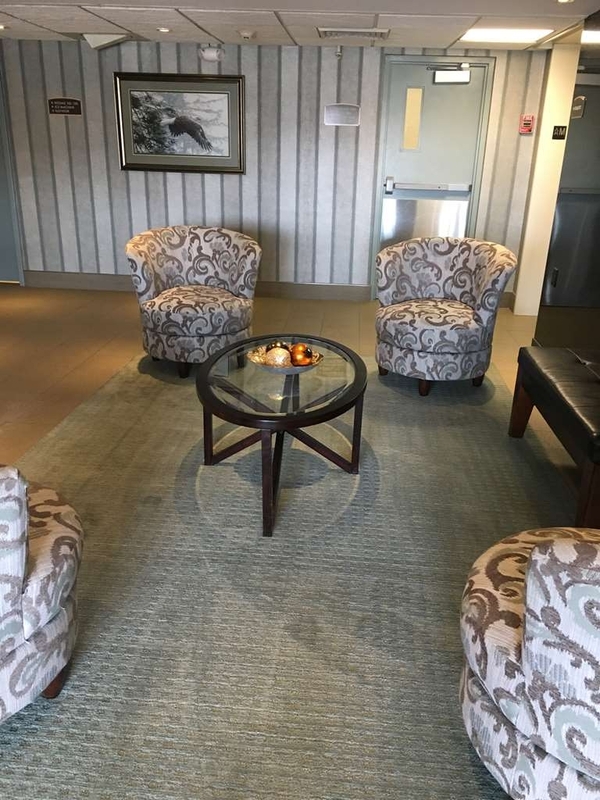 We have recently replaced all the door locks with latest "RFID" technology, as well as replaced the lobby carpeting with tile. "Best Western Crossroads August 2017"
My family and I traveled to Thunder Bay to help out family there and required an extra two days to complete our tasks. The rooms were immediately booked and we got to stay on in the same room. Staff were all friendly and courteous and appear happy in their jobs, which is a compliment to the supervisory staff. I will certainly stay here at the next opportunity. "Best Western Crossroads Thunder Bay"
I would reccommend staying at this motel to anyone travelling with or with out children. This trip was a business adventure however I have stayed here in the past with family and found it to be equally accomodating. Quiet clean and very relaxing with a very good breakfast assortment. We always stay here when we are I the city. It is always clean and the rooms are fine, the breakfast is all you need. I would recommend this hotel. We always like to stay in Best Western Hotels because you always know what to expect. "A Generally Well Operated Motel"
The Best Western Thunder Bay is conveniently located right off Hwy 61, a block from Hwy ON-17. But we did not find it too noisy to bother our sleep. The facilities are generally well maintained, and everything works out well for us. Besides the standard hot buffet breakfast, this management does include a very nice "make-your-own" waffle which includes all trims including strawberry sauce and whipped cream. As always, this hotel has met our expectations and served us well. They have held their prices and kept up with their remodel. Although we had made other arrangements for breakfast, the free one at the hotel usually is fully satisfactory. The staff is very friendly, knowledgeable, extremely helpful. The rooms are superb, very clean (spotless), well stocked with necessities (shampoo, conditioner, towels, soaps, coffee/tea, hair dryer, iron and board, clean TV remote) . The best service ever. And they are located where they are very easy to find. I like this hotel because of the easy access to the ground floor rooms. I can drive up and park right outside your hotel room. the hotel is always quiet and a good night sleep is easy here. there is a continental breakfast that is available, but I have never used it. "Best Western Thunder Bay Crossroads"
Stayed here as hotel was close to medical clinic we were attending. Typical hotel as for noise from other guests using shower and banging doors in hallways. Found beds very hard but overall rooms were modern and clean. Fairly good breakfast offerings in the morning. Tip: ask for a room on the north side of hotel at check-in. 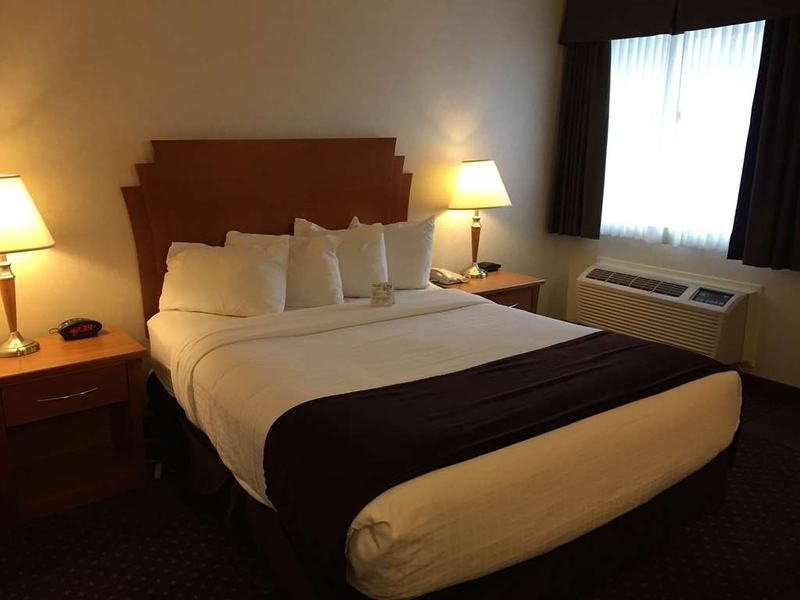 "Trip around Canada and USA"
Our room was very clean and the staff was kind and helpful. The hotel was a little too far from the TransCanada highway; however we did not expect the town itself to be quite so distant from the highway. There was a good choice of eateries nearby. "A good place to stay in thunder bay"
Stayed here for 2 nights on a cross country journey. It's easy to access from the highway and close to restaurants, shopping and historic fort William. Beds were comfortable, breakfast had a standard selection of hot and cold items. Wifi also worked well. All in all a good place to stay. My mom and i went to visit my younger sister in Thunder Bay and we stayed at this hotel for four days. Staff are very friendly, knowledgeable and helpful. The location is beautiful. I would definitely stay here again. We were on the road for 16 hours and checked into this hotel in Thunder Bay. Staff were very courteous, the hotel was easy to find and not far from our main travel route. Room was spacious and very clean with all the amenities you would want for a night stay. Breakfast we excellent with many choices for any size or style of appetite. great value for the money. 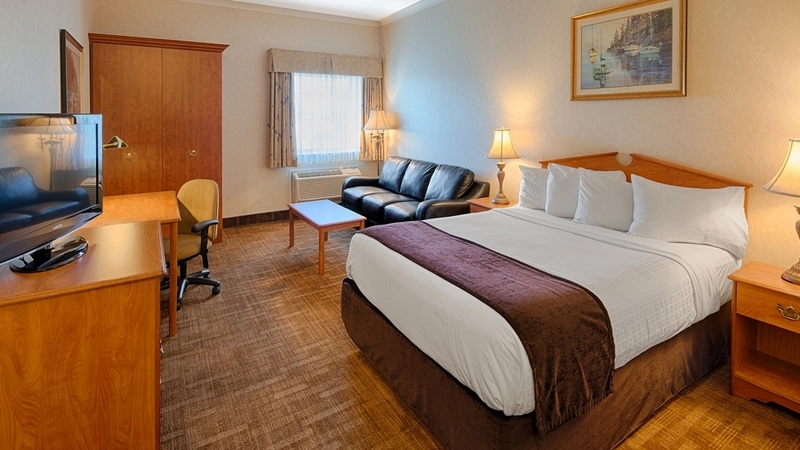 Updates to rooms make the Best Western Crossroads in Thunder Bay,ON a great place to stay. They offer a breakfast which has a good variety of choices in a very clean room. Employees are always helpful and make you feel welcome at the hotel. Clean hotel and rooms. Staff was very polite, breakfast was nice, the normal breakfast. The room was arranged a little tight, might have been easier to move around it middle counter was moved. the location was very nice, right of the main road through Thunder Bay, Restauarants within walking distance. I have been staying here for a number of years and have always had great customer service and a restful stay. The staff has always been friendly and accommodating. I enjoy my stays at Best Western Properties. Beautiful rooms, excellent staff! Very good, free breakfast. Staff was very helpful with where I needed to go. If you want just a place to sleep that is in the center of it all, this is the hotel to stay at. "Great Hotel in the Heart of Thunder Bay"
Would definitely recommend. Especially since soooooo many of the smaller hotels and motels have increased there price to 100+ and are no where near as nice as this hotel. I would highly recommend that you spend your money at a BW hotel! A leisure trip and nice spot to relax at. Breakfast was okay but not great, rooms were good and internet was great. Parking was very abundant and very clean lot, lots of room and well marked and lit. Close to restaurants and other shopping facilities, very nice spot and not much traffic noise. Enjoyed our overnight stay; the room was clean, comfortable and easily accessible as we were on the ground level. Great that they are pet friendly. The hotel is situated close to restaurants, grocery stores, etc. Very handy. Would recommend this hotel. Good location, conveniently located near to restaurants and shops, conveniently located near the high way. I stayed here multiple times when I pass through Thunder Bay and never had any problems. The staff are friendly and helpful. The staff at this hotel were very welcoming, friendly, helpful, and courteous. I would highly recommend staying here while visiting Thunder Bay. During my stay here, I was not feeling well. Everyone went out of their way to help me. "Excellent except for other guest"
"Great time in Thunder Bay"
Spent 47th wedding anniversary here as we are very pleased with the accommodations and staff. Another very nice stay. Quiet, close to fine dining within walking distance. Very clean, great breakfast and overall an excellent place to stay. Service friendly and helpful. Very clean, beds are very comfortable;always look forward to the continental breakfast very satisfied. Close to airport, within short walking distance or shuttle provided by the airport. Amazing staff that understand the unique needs of tired (cold/wet) motorcyclists. It was July 1 and Canada's 150th birthday. They pointed out that the City was having fireworks at the waterfront. Despite the weather on our trip, this hotel made us feel welcome and grateful for our business. "For the price, its good"
So I spent a week at this hotel while visiting my in-laws. The room was clean, spacious, and functional. It had free WiFi, free breakfast and was not far from the airport or a number of businesses. The only complaint is there is no room service or in hotel restaurant. There was a fridge and microwave but still, no room service means no ordering in food to the room when you don't feel like going out. Overall good location and not too bad a price. Hotel paid for a taxi to get us to the hotel from the airport very late in the evening! Breakfast had a lot of options as well! Would definitely recommend this hotel to anyone! Great experience! Give it a try if you are ever in Thunder Bay! "Close to Airport - Restaurants"
The hotel was located minutes from the airport and also well walking distance to restaurants nearby. As I have stayed here on many occasions I am satisfied with the courteous staff and the clean comfortable rooms. Breakfast is an added bonus and helps to start my workday off right. Definitely a place to stay if working out of town or just travelling through. The facilities were very clean and we had everything we needed. Bathrooms especially were very clean and beds comfortable. Only down side was that we had some airport noice and highway noise at night. It is the place to stay when i travel to TB. Quality staff but the hotel is beginning to show its age. Still though worth the money. 200 hundred characters is too many. Not much else I can say. Hope you have a great day! 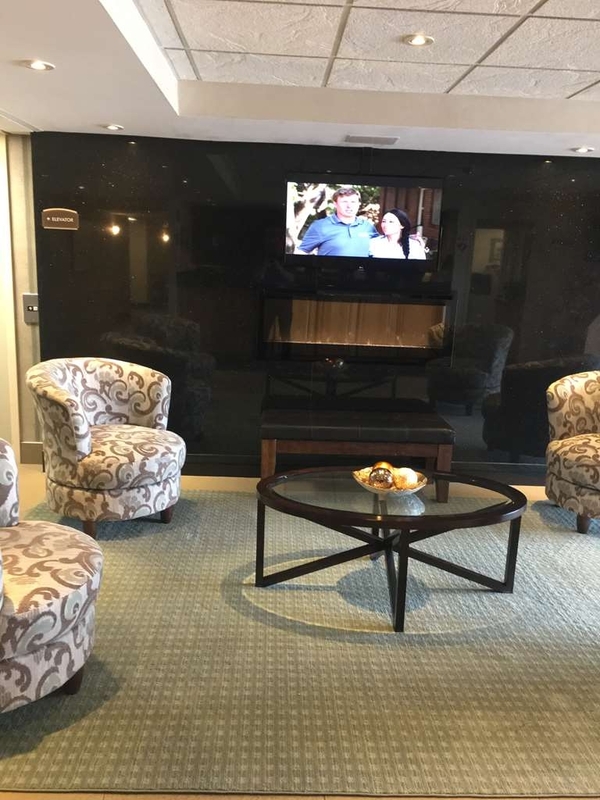 The staff is friendly,the room is clean an the hotel is located close to the airport.. Taxi service is spotty so make sure you book one the night before. you are also walking distance to some restaurants for dinning. Great value, good amenities and excellent staff/service with the exception of one staff-person. Pet-friendly facility. Located near the airport and major highways making it ideal for the traveller. Highly recommend this establishment if staying overnight in Thunder Bay. 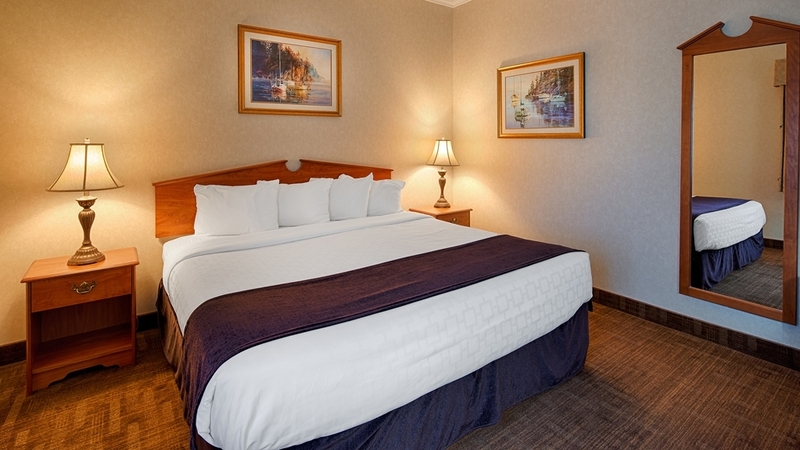 "A very good place to stay in Thunder Bay"
I enjoy staying at Best Western. The rooms are well appointed. The staff is friendly. There are great places to eat in walking distance (Naxos especially). Convenient location near the airport as well. We have stayed at this Best Western many times. Rooms are clean and cozy. Breakfast could use a little improvement but there was enough to eat. Staff is very friendly and ready to help with your needs. "very nice place to stay at"
For a hot breakfast it was a bit cool. otherwise a pleasant experience and would stay there again. In the bathroom toilet was to close to the wall and to low to the floor. not a good experience. All in all it was a pleasant stay, and would stay there again. We have been staying at the Crossroads Best Western for many years. We always have great experiences when we are there. The rooms and staff are always great. The staff makes us feel right at home. Keep up the great work. After staying at the Best Western Pembina Inn in Winnepeg, this Best Western was a bit of a letdown. The room was large and clean and all the amenities worked but the staff was not friendly (not rude just not personable). This is the first place that we have stayed that the front desk could not come up with a wine glass for our use. The lobby is small, there is only one elevator and that appears to have been added as an afterthought, and the breakfast room is on the third floor. The breakfast itself included eggs and sausage and was well equipped. This Best Western seems to be a budget motel dressed up with the Best Western name. Thank you for staying with us and for posting a review. Best Western International has 3 " grades " of hotels under the Best Western Name. There is a " Best Western Hotel" like ours. A "Best Western Plus Hotel" like the one in Pembina, and a "Best Western Premier Hotel", like that in Hamilton. We do offer a nice breakfast, but we do not have a full restaurant nor a liquor license. We have recently done a number of renovations ( upgraded all 2nd floor bathrooms, new tile in the lobby) and have many more planned over the next 2 years ( extensive landscaping, rocking the outside of the 1st floor, replacing all hall carpets, replacing the breakfast room flooring with laminate, replacing the fitness room floor with a rubberized product, replacing all the furniture on the 3rd floor, plus a number of other projects. "Best Western is the only place to stay on the road." As always I am never disappointed with my stay at any Best Western. When ever I travel I will always try to stay at the Best Western because the rooms are always neat. Internet is fast, and the breakfast always hits the spot. Best Western Crossroads motel is a great place to stay for a visit in Thunder Bay, ON. It is a very clean, quiet hotel close to the airport with a good continental breakfast. Variety provided for different diets. Friendly, professional staff willing to assist with guests requirements. My husband and I travel through the area a few times a year with our two small dogs. Thunder Bay is our stop over place. Until recently, we stayed at a downtown hotel but couldn't stand it there any longer. My preferences start with pet friendly then price. My research landed us here and I'm happy to say we were pleased with our stay. In my experience, your pet policy/fee is reasonable, and I hope future guests don't cause that to change. Your outdoor property is clean with grass for them to sniff around. I walked them through the neighbourhood on the walking path that is right behind the hotel. Bonus! Our room was large and clean and quiet. I never heard any noises inside or out the entire time we were there. Breakfast was good with the standard items found in hotel breakfasts. Our only issue was no hot water in the shower, only warm. I reported this when we checked out, so, hopefully not a recurring problem. We'll see when we stay again because we will be staying again. We found this hotel very clean and updated. Service was friendly and quick. The bathrooms were updated and clean. Beds were clean, cozy and comfy. We were able to access our room via the parking lot and the hotel hallway. They are pet friendly and this aspect made our stay much easier. They offered a continuous coffee, tea and hot chocolate bar just down the hall; along with coffee in the room including a microwave and fridge, Breakfast is also included the price offered. Choices varied from bacon and eggs; to muffins/toast/bagels; cold and hot cereal, yogurt, etc. Quick crash for the night waiting to catch the 5am flight the next morning. Everything was great, except the TV remote had a problem with the channel UP button. I did not report it I just went to the high channel and went down instead :P Hotel was quick, clean, and a comfortable stay. Would highly recommend. Naturally you will hear planes flying until the last flight of the night and then again early in the morning so you can't really complain about it. Breakfast is not available at 3:30am so I did not use that. Stayed here before and would stay again. Located close to airport runway so if you are ok with some noise and need to be close to airport then good stay. If you want to be close to city center then be prepared for a 15 minute drive, Hotel was clean newly renovated. "Best place in Thunder bay"
Very clean friendly and quiet place to stay. I recommend that you stay here and the price is awesome to. Plus you get rewards and free gifts. We have stayed there for over 20yeats with no problems ever. I always stay at Best Western Crossroad when I travel to Thunder Bay. Excellent location, good service, good sleep with comfortable beds. It's a nice quiet hotel, located close to the airport and offers a shuttle service. I found this hotel to be clean and well cared for. The internet is good, it is close to several excellent restaurants, stores and the airport. The people are friendly and helpful and the staff cares about servicing the guests. I stay here.....a lot! The staff treats me like family, the rooms are clean, breakfast is excellent. There are several restaurants within walking distance, and the expressway is very handy if you want to drive somewhere. The neighborhood is very safe to go for a walk around too. I highly recommend this place if you just want a clean room, good service and friendly people! "Great bed and great sleep"
If you are travelling through this region and are looking for a good nights sleep this is my recommendation. Check in was a snap and so was the check out. breakfast was fast and efficient and we were on our way. Stayed here one night during a Thunder Bay stopover. I wanted a main floor room with outdoor access, but the website doesn't allow you to book that preference. I did get the room I wanted after all, so it worked out OK. My initial room had a damaged door lock, but front desk personnel changed my room immediately upon being made aware of that problem. This is a mid range facility, showing some signs of wear - scuff marks on the door, that kind of thing. While the room appeared clean, there was a bit of a musty smell to it. While I would not stay here long term, it is OK for an overnighter, with a convenient location. One thing to note - it appears they retrofitted a false ceiling in the hallway of the ground floor, and it is not particularly high. If you are taller than 6'2", you might finding yourself wanting to duck down to avoid the automatic sprinkler heads. "Fantastic for a lower priced hotel"
It's hard to be perfect because something always goes wrong. But this place delighted me. Perky and helpful front desk staff. Great breakfast. Love the fruit spreads for the waffles. And the toppings for the oatmeal. Room was clean and quiet, everything worked, high speed internet worked always and was high speed. The only improvement I can think of suggesting is that the lobby is small and cramped. Too many chairs. Convenient to the airport, supermarket and some restaurants. Nothing bad, nothing outstanding. Bed was a little hard, bathroom was clean. Sink was outside washroom which I don't really like. Breakfast was OK if uninspired. I haven't stayed at all that many Best Western hotels so I don't know how this one compares with other Best Westerns. For the money, it was fine. Thank you for choosing the Thunder Bay Crossroads and for taking the time to post a review. We are in the initial stages of a 3 year design upgrade program. We have just repainted the outside of the building, and will be adding rock to the first floor and entrance way next year, as well as landscaping. In mid December/January, we will be tiling the lobby and adding an area rug and re-carpeting all of the hallways. We will also be renovating all of the bathrooms on the 2nd floor. The following year, we will be replacing all of the furnishings on the 3rd floor. There are a number of other projects in the planning stages such as all new paintings, new televisions, etc etc.... Please keep coming back and watch us slowly change. "Delivers exactly what it promises." Good solid property, especially for people arriving or departing by plane - a three minute cab ride (which the hotel pays for) is all it takes if you need just a little more zzzz's. Rooms are well appointed, very spacious and immaculately clean. Bathroom was a little smaller in the sink area but fine for what we were after. We came into the city the night before our trip just to be close to the airport. Buffet breakfast was included but we were gone before they opened it (6:30 to 9:30). The room was neat, clean and well appointed. It seems as though there was recently a total renovation of the hotel. The staff was friendly, greeting you in the hallways from the front desk to the cleaning staff to the maintenance man. The continental breakfast was more than adequate. Even though we were across from the airport and there was a lot of air traffic we did not hear any noise from our room. The room had a good air conditioner/heater. Bathrooms were ceramic tile. The shower head could have been better but I understand the logic of low flow. Recommended. For an overnight stay...the staff were the most memorable. Very friendly and really wanted you to be happy. No frills, pretty clean...slept OK. Heads on beds...that is the goal. Would certainly stay again if on the road again. Cons: nothing! Pros: super comfy beds! Great bathroom, in two separate rooms, fabulous shower head! Ask for main floor - no extra cost to back up to your door, unload, and load. Great desk area with lamps everywhere that have power outlets so very much appreciated by those of us who travel with numerous technology gadgets. Fridge. Nice and clean!! Thank you!!!! Oh yes and the FREE breakfast was phenomenal - hot: oatmeal, waffles, sausage, omelettes and fabulous toppings for each, toast, muffins, english muffins, bagels, butter, jams/jellies PLUS cold: cereals, milk, hard boiled eggs, and probably lots more I've forgotten!! No need for lunch folks so take THAT off your travel budget. I have stayed at this hotel on several occasions and I am really impressed with the cleanliness of the rooms and the diligence of the cleaning staff. Breakfast is average and the area for items is a quite compact. Quick access to the highways the airport and restaurants. Overall I would recommend this hotel to anyone visiting Thunder Bay. Very nice hotel, outside entrance to ground floor rooms, excellent location and good breakfast! The staff was very nice and made check-in a breeze. Even though hotel is located on a busy corner it was very quiet. We would definitely stay here again on our next trip to Thunder Bay. Stayed here one night on a trip west. Good location close to trans-Canada Hwy. Rooms were clean and pleasant. Staff was friendly. Lots of restaurants and services in the area. Left too early for breakfast so it would have been nice to have a few muffins or such out early. While there was noise from the airport and the highway, it was not too bad. Would stay here again. My wife and I were driving Australian friends to Winnipeg from Ontario and booked this hotel prior as I have a BW Platinum Rewards card. On arrival, the desk clerk seemed puzzelled that one of our rooms was already occupied but this was resolved in time. The bathroom had not been cleaned in one of our rooms but was quickly taken care of when reported. I was informed that I had enough BW Reward points to qualify for a free night which I appreciated. The complementary breakfast had both hot and cold items and really impressed our Aussie friends as that doesn't happen "down under". Excellent location, very clean hotel, rates comparable. All staff very friendly, courteous and accommodating. Employees were dressed semi-casual which made reception in very nice lobby relaxed. Room was clean, comfortable & decor was up to date. Excellent tv and internet reception. Wonderful continental breakfast on the third floor (via elevator) with lots of windows to enjoy the view. My husband & I have stayed here many times, whether just city shopping & appointments or traveling. Minutes to airport. 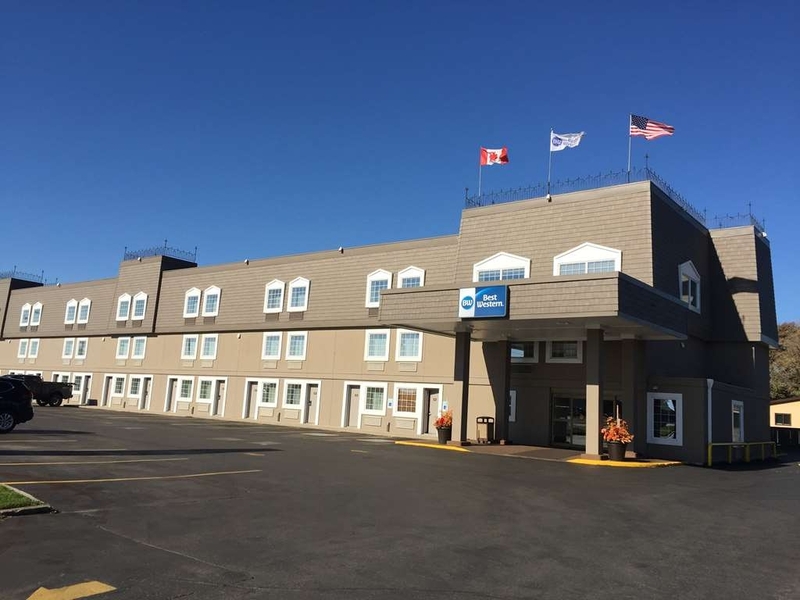 "Basic but a good place to stop"
The Best Western Crossroads in Thunder Bay is a short hop from the airport and not far from an array of family style restaurants. It is pretty basic, but the rooms are comfortable and the staff very friendly. There is no restaurant, but there is a breakfast buffet that is quite acceptable and a small gym as well. "Family Trip to Thunder Bay"
Very friendly staff, and knowledgeable. The room was very comfortable and clean. The continental breakfast was very good, however the serving area needs to be a little bigger. I would recommend The Best Western Crossroads to family and friends. For being on such a busy intersection it was surprisingly quiet in our room. Also the continental breakfast was great and the staff was amazingly helpful. Great eats in the area as well. We've stayed here many times when having to fly out (airport is very close) and they offer you a cab ride to and from the airport. I just stayed one night as I passed through. The hotel was ok, nothing fancy but I had a good night's rest. The service at the front desk was really great and they were helpful in telling me places to go eat and where to get as on my way out of town. The only complaint was the parking was completely full as the hotel was completely booked. Great location close to the airport. Good breakfast. We booked late and therefore could only get a room for 4 with a queen and a pullout sofa. I would not recommend the sofa bed as it was uncomfortable. But otherwise this is our go-to hotel when we stay in Thunder Bay! Friendly staff. AC was broke in the breakfast room, the owner came down and apologized to everyone for the inconvenience. What can you do? Imagine it's not easy to find a unit on a Friday afternoon. I thought it was great that the owner stepped up. Would have been easy for him to stay home and let staff deal with it. "Woe to those wanting to park"
One night stay. Can we say tiny parking lot? A couple larger vehicles meant parking for some on the street. Room itself was OK—the bathroom floor wasn't the cleanest. My room was on the main floor so rather noisy. Friendly enough staff. Thank you for choosing us. I also wish we had a larger parking lot. During the summer months we see a lot of trailers in our lot that takes up more space per room. For those bothered by street noise, I would suggest rooms at the back of the hotel. Thank you again and we hope that you can return when we have less trailers. "Perfect, but for the air conditioner"
Chose this hotel because it offered an airport shuttle and was a good value. The staff was terrific, the rooms were comfortable and clean, and there was a lot to choose from in the continental breakfast. Our only issue was the extremely noisy air conditioner - each time it cycled on, it sounded like a helicopter was landing on the roof! Not our first choice of accommodation when in Thunder Bay, but due to a family recommendation we decided to stay here on our last visit. We were not disappointed given what we had heard. The staff were very helpful and on one occasion rectified a concern we expressed withe door to our room immediately. The continental breakfast is good. There is tea, coffee, juices, cereal (hot and cold), toast,muffins, baked goods, boiled eggs, omelet, sausages and French toast.. All more than one would expect as a continental breakfast. Breakfast room is small but if you hit it at the right time you can get a table. Otherwise there are trays to take food back to your room. Great proximity to restaurants in the area as well as the airport. Would definitely stay there again. BW Crossroads TBay is always extremely clean. The staff at the front desk are always efficient and friendly. I continue to choose this hotel on a monthly basis because of these qualities. I have no other choices for other hotels in the vicinity. Although it was a basic hotel with few amenities, it's location suited our needs. We especially liked the fact that we could get a room on the ground level. There was a wide choice of breakfast items. Coffee & tea were also available all day. "Surprisingly comfortable, easily accessible, epic pillows"
The pillows at this lower-end hotel rival bedding at some of the five-star properties I've stayed at. Bathtubs are deep and comfortable - perfect for unwinding after a long day of travel. 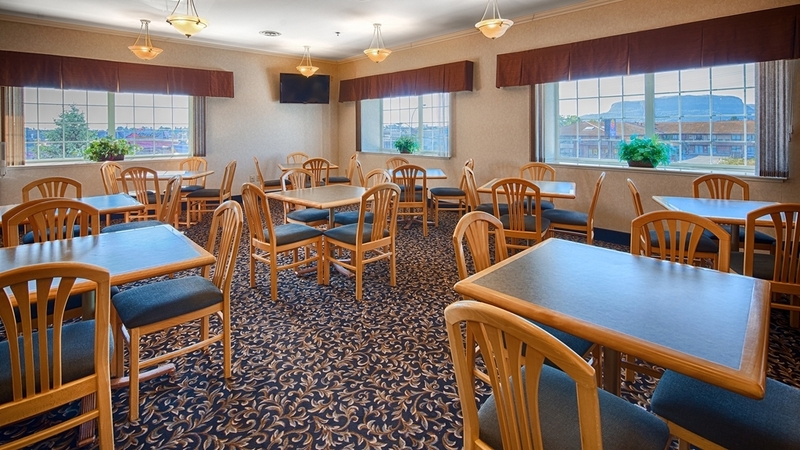 Hotel is conveniently located to the highway and walking distance from various restaurants and basic stores. Would absolutely return. "Nice hotel close to the highway"
Second time staying here. Very nice hotel. Friendly staff. Was able to park directly outside our room. Was travelling with our cat, had no issues. We stayed at a few different hotels on our trip, and this one was probably the best. We travel through Thunder Bay regularly and this is our go to hotel. All the staff we encountered were friendly and so nice. Rooms are always clean, fresh. The beds are so comfortable after a long day of driving. The morning breakfast and the woman that was working it were really great as well. Don't think twice about staying here. this best western is a MOTOR INN but not advertised as so on the webpage -very deceiving. If i knew it was a motor inn would have booked at another hotel. In addition, the Breakfast room is on the third floor - this was very odd and the layout was inefficient. As well, when we went for breakfast the two employees in the breakfast area was talking about guests in a negative manner and one employee was rolling eyes and impatiently waiting for the guests to move away from the coffee machine so she could replace the coffee- unprofessional! All Best Western Hotels are required to change their property signs within the next few years, to match the new corporate logo. We are taking this opportunity to drop the old term " Motor Inn" from our name. We have changed most of the "online" sites as well as the electronic and print advertising to reflect our new name of "Thunder Bay Crossroads". The new signs for the building as well as new Highway Billboards and road signs have been ordered. Our breakfast room is on the 3rd floor. Originally the hotel did not have a breakfast room. The 3rd floor was added about 12 years ago and the breakfast room and fitness rooms were integrated in the design. Many of our guests enjoy the view of the Mountain from the 3rd floor breakfast room. Pet friendly, nice clean rooms, beautiful bathroom. In spite of the closeness of the highway not noisy - at least not on the ground floor that looks to the back, handy to be able to access the car or take the dog out. Good choice of breakfast dishes (beware breakfast ends at 9:30!) on the 3rd floor (with a view) breakfast room. Lots of restaurants close by on Arthur street - would recommend Wasabi (within short walk). 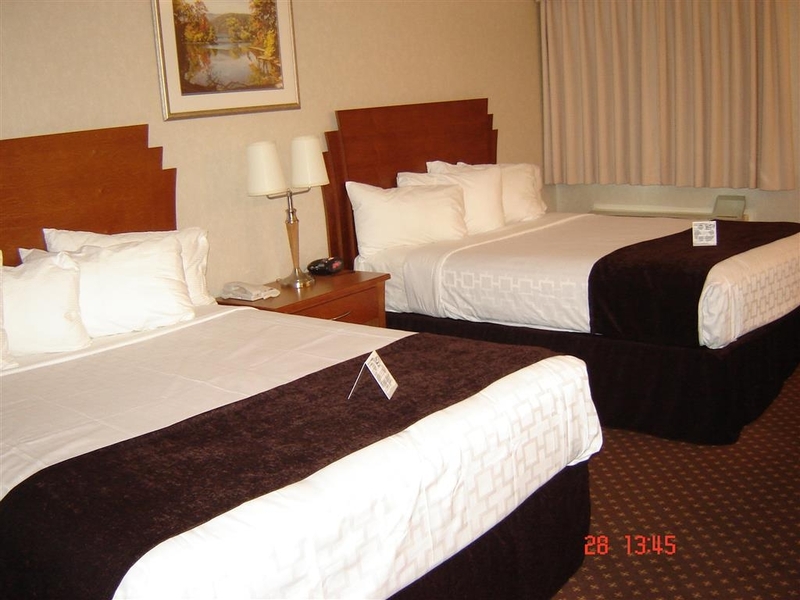 Very nice hotel that has a great location.Great accesss to the trans canada highway. Very friendly staff and comfortable rooms. I would recommend this hotel to my friends and plan to stay here again on my return trip. We have stayed in this hotel 3 times now. Wonderful staff and handy location. We will stay again next time through. Rooms while smaller than some hotels are comfortable and clean. Breakfast very good. Try Naxos Greek restaurant just up the street. "Quiet convenient and close to all"
We have stayed here several times. Excellent location to highways, restaurants and downtown. Views are wonderful from 3rd floor. Rooms and linens and beds are worthy of the best of the BWs. Very professional staff. Breakfast is great. 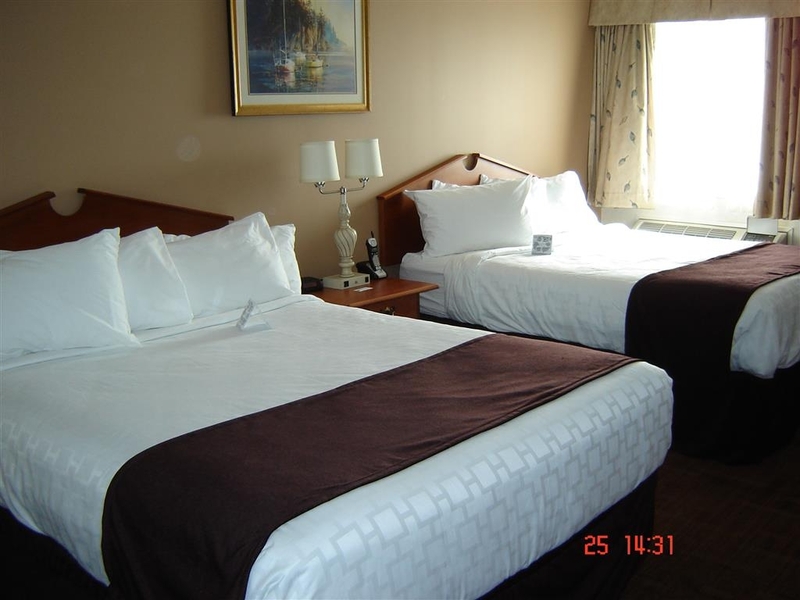 "First trip to Thunder Bay, Ontario"
Very clean and nice hotel rooms. Bed was perfect - not too hard - not too soft. Larger than normal refrigerator in room which was NICE! Breakfast buffet was very nice. Pet friendly - Came to Thunder Bay for the Lakehead Kennel Club dog shows and this hotel had lots of grassy areas around the hotel for walking dogs along with adequate waste recepticles. We enjoyed a nice stay at this hotel on our way home to Winnipeg. The rooms were clean (although the layout was a bit squishy from the doorway to the beds). The beds were comfy, the bathroom was spacious with good water pressure in the shower. The bonus was a delicious hot breakfast which included sausage rounds, omelets, waffles along with other typical breakfast options offered in hotels. The only problem was the eating area was on the third floor and the AC wasn't working, so it was extremely warm in there. Also, the layout in the eating area was poorly laid out. People were continually bumping into each other to get the food. I thought the price a bit high for the hotel, so I'm not sure if I would stay again, but if you are passing through, it's a good option. We liked the convenient location of this hotel. It's not fancy but our room was clean and the bed comfortable. Front desk staff were friendly and a very good breakfast is offered as part of your stay. The room was quiet as we were on the backside, away from a main road. If possible ask for a room on the quiet side. We will consider staying here again. "Best breakfast for road travellers"
On the road from our cross Canada trip, was there for one night only. Check in was easy and quick, room decent comfortable. Breakfast was generous and certainly more than the usual continental dried muffins and limp eggs from most hotels. My son and I had a relaxing stay at BW Thunder Bay while driving across the country. Comfortable beds and very clean. Good value for price. Friendly and helpful staff. Great view from breakfast room on 3rd floor. "Good location. A little pricey. Mediocre breakfast. Rooms ok."
Booked 2 nights in July. Place was full and there was no parking available in lot. Had to park next door. Room was ok. Bed was comfortable. Shower was hot and bathroom was clean. Breakfast was pretty sparse. Staff was friendly. Moved to another hotel after 2 nights. "Good place to stay in Thunder Bay"
We stayed just 1 night as we were en-route home. We were pleased with the drive-up room, which was large and well-equipped with comfortable beds, good black-out drapes, and a small fridge. Breakfast was typical of a chain hotel but there was certainly enough selection to keep most people happy. The hotel is in a safe neighbourhood; my only comment would be that the sign on the main highway has a directional arrow for Best Western but does not specify which one (Thunder Bay has 2 BW's) so we ended up making a wrong turn. Nonetheless, I otherwise thought our stay here was fine and would definitely come again. Stayed 1 night passing through ThunderBay on our way to Dryden, Ont. Hotel is situated close off Hwy 17 (TransCanada) and not far from the airport. We had a restful stay and would highly recommend if passing through. 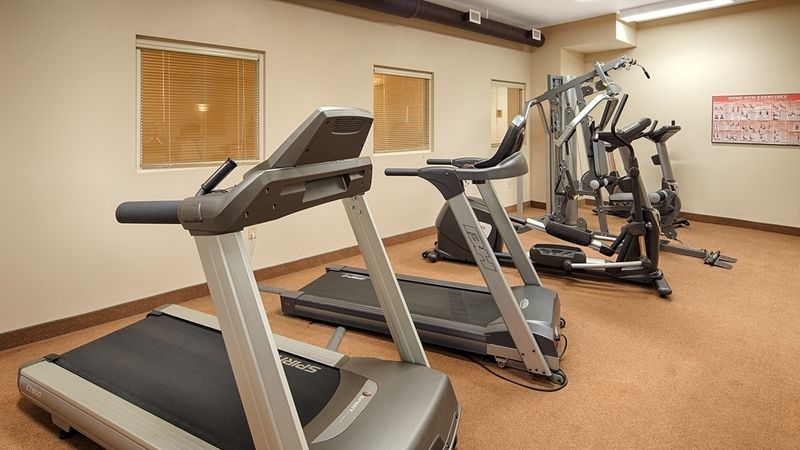 We were situated on the 3rd floor where the workout gym and Breakfast area were located. If on the 1st floor you have direct access to your room and can park outside your door. Very clean looking from the outside with spacious rooms on the inside. Internet, breakfast and sleeping accommodation and amenities were very good. Would stay here again if required. We stayed here for two nights while in Thunder Bay. The hotel was clean, quiet, firm beds and the breakfast had plenty of choices. The front desk staff was very helpful. The location was good for visiting some of the tourist sites and was an easy walk or drive to several restaurants. This hotel was a good choice for us. In spite of the horrendous weather that was going on outside, I felt as safe and comfortable as I would have at home. Then, in the quiet of the morning, I was able to go upstairs and enjoy a real, hot, relaxed breakfast and make a new friend. My husband and I are senior trike riders. We stayed at the Best Western Thunder Bay Crossroads on 6/14 & 6/15. From the moment we arrived the front desk staff was friendly and accommodating. We asked for a 1st floor room, which has a door from the lobby and a door in your room, to the parking lot. We loved being able to haul our luggage through the back door to our room. Our room was in the back and was very quiet. It was clean and the cleaning staff were friendly also. The continental breakfast was exceptional. 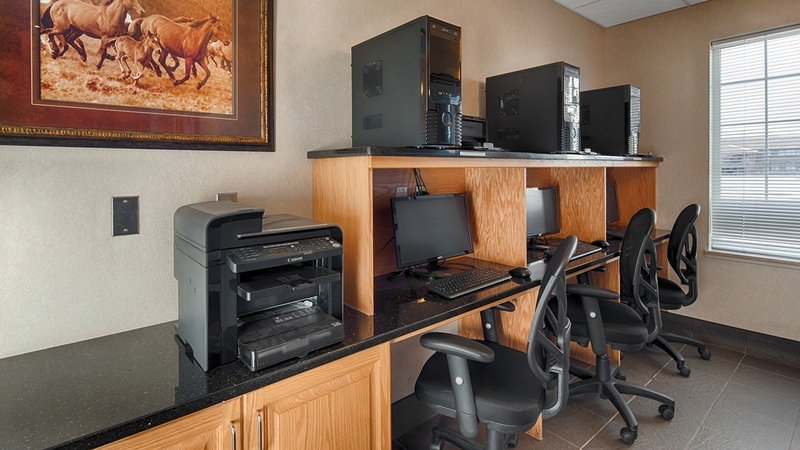 This motel is centrally located and near all the attractions that you would want to visit. We will definitely stay at this hotel again in the future! I basically slept here and it is close to the airport. There are a few places just as close but I didn't have my secretary investigate for prices and proximity this time but she will next time. Very expensive bed for 6 or even 20 hours as anyone's case may be. Clean and mostly modern. It's a Best Western, not thee Best Western. I encourage you to shop around if you want a typical place to stay for a reasonable price. "Very friendly service, dated rooms"
I stayed at the Best Western Crossroads as I was passing through Thunder Bay. Having been to several other Best Western Plus, this hotel is due for a renovation. It was very clean however but the building was tired looking. The bed was comfortable and there was minimal road noise (second floor facing road) The continental breakfast had many options and there was constantly an attendant filling stations and wiping down the area. Overall the free wifi and free parking were appreciated but at the end of the day I would prefer to stay in a newer hotel. The staff were friendly and made me feel welcome. Our room was clean, quiet and comfortable. The bed was very firm. The breakfast wasn't great, eggs were cold and the toaster burnt the toast black, the woman who was working was nowhere to be found and the dials on the toaster said not to adjust. Also we were at breakfast a few minutes before they opened ( 3 ) and when she can to unlock the door I asked if we could come in and sit down, I am disabled and standing is difficult, she said " I have to check the coffee" and promptly shut the door. I was only asking for a chair not coffee. This is our hotel of choice when in Thunder Bay. Excellent location. The hotel is quiet, clean, excellent wifi, comfortable beds and excellent staff. Walking distance to restaurants, grocery stores & liquor store. "best place ive stayed in canada!! !1"
We were welcomed by Lisa who was very polite and professional, she's a keeper. Quick and easy check in. Rooms are very accommodating, clean and comfortable. Housekeeping do a wonderful job. When checking in we we're also given a complimentary bottled of water which is a great idea thank you for that. All in all i highly recommend this hotel. Great staff and very clean. Oh and the free hot breakfast is an added bonus. "Great place to stay in T-Bay"
The location is great, on Arthur St. right by highway 61, so you can get anywhere you need to quickly. The rooms are very quiet despite the traffic outside and the beds are really comfortable so I had a great sleep. Perfect way to end or start your day! I stay here regularly for business and I love this hotel. Close to everything and the staff all know me so check-in/check-out is so fast - they even send me a Christmas card! Rooms are always clean and comfortable and the breakfast is delicious. The coffee in the lobby is the best and I always have a couple cups before I leave in the morning. First time I stayed at this hotel on the main road side, traffic and airplanes most of the night. I will request a back room for future stays. Otherwise I like the convenient location of this hotel. Clean rooms and comfy beds. 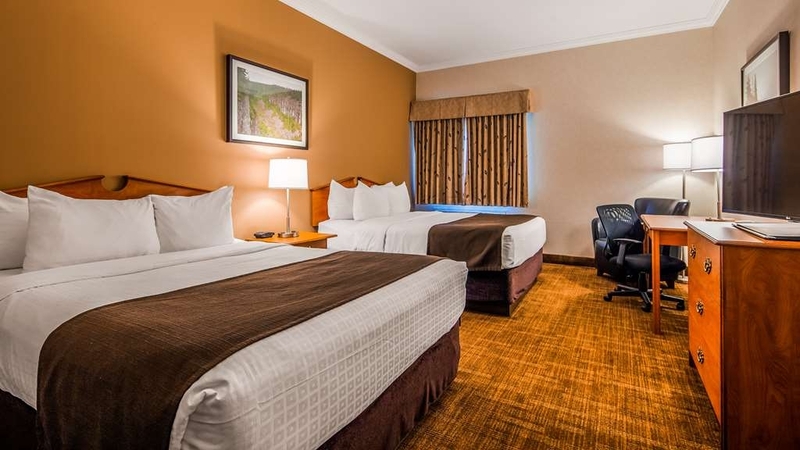 The rooms at BW Crossroads are clean and spacious. The staff are very welcoming and helpful. I've stayed 3 times for work and the beds are very comfortable, one of the best nights sleep I've gotten away from home. The Continental breakfast is also very good. The hotel is very convenient to the airport, it is great having the free breakfast. Only downfall is there is no airport parking there. The staff was very friendly and helpful. It is a great location for visiting Thunder Bay. This facility is an excellent place to stay in Thunder Bay! We found the staff courteous, the facility clean and comfortable and the rates reasonable. The Free breakfast was very good, offering Waffles, Bacon, Sausages,eggs, oatmeal, cold cereals as well as fruit juice, coffee, tea and milk. The building is quiet and there are a number of places to dine nearby. Staff were exceptional, my focus being on the cleaning ladies. They made us feel comfortable and the rooms were very clean. The cleaning staff always made time for us and made us feel like number 1. The breakfast was the most complete and fresh, bar none. 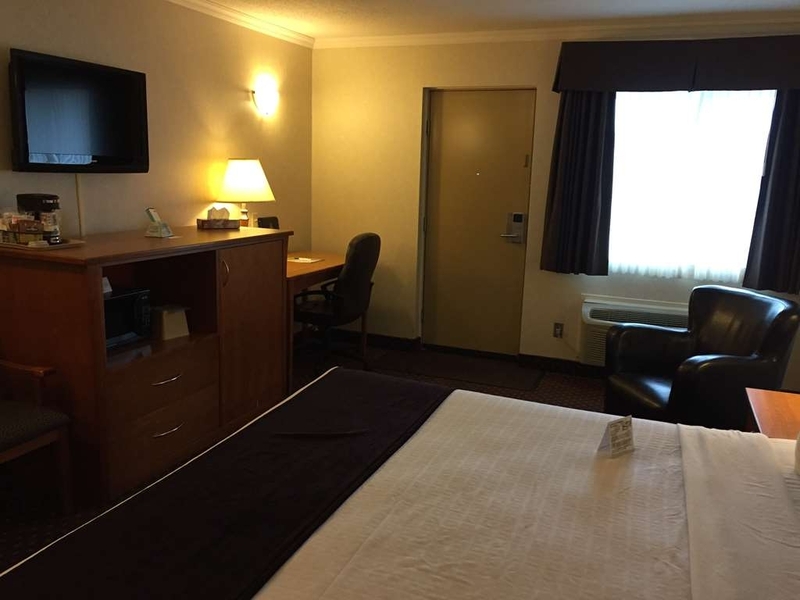 If you want a comfortable stay and great service then The Best Western Crossroads Thunderbay is the choice for you. Have stayed here many times for both business and pleasure. Have never been disappointed. Staff are very accommodating and hotel is located near the airport and very close to restaurants and shopping. "My New Home Away From Home"
I REALLY like this hotel in Thunder Bay. It is not one of the newer ones, but it's certainly one of the better ones for business travel. I always stay on the business floor when I am here. It is always quiet, which is essential when spending a great deal of work nights in a hotel. Sleep is important! I am always greeted by friendly staff at the front desk. The gym is pretty basic, but has what I need. Breakfast is always very good and fast (the toaster is crazy fast). The breakfast room is alway kept clean and stocked up. They serve a hot breakfast (usually some kind of eggs as well as a breakfast meat) hot or cold cereal, a variety of breads, waffles, juices, etc. And flavoured coffee cream which I really appreciate. Fridge, microwave coffee maker. Restaurants and convenience stores within walking distance. Also a nice running trail right beside the hotel along the river. I have been staying there at least once per month for the last 6 months or so, and will be there again this week. Home away from home these days. Thank you for taking the time to review our hotel. Your responses allow us to gain guest feed back and ultimately improve. I am pleased that you enjoy us as we are. We are in the initial stages of a 3 year " design excellence program" This will include - landscaping, painting the outside of the building, changes to our entrance way, new flooring in the lobby,(carpets and tiles), new hallway carpeting, new rubberized flooring and lighting in the fitness area, new flooring, lighting and blinds in the breakfast area, upgrades to the 2nd floor bathrooms ( replacing tubs with showers), new furnishings in the 3rd floor bedrooms, along with new in-room paintings through out the hotel. We stay at this Best Western quite often when coming to Thunder Bay Area. We always feel welcome and the staff is caring and friendly. Everyone goes out of their way to may our stay enjoyable. The Breakfast is outstanding and Karen is a joy to talk to. The rooms are very well kept, clean, and tidy. We recommend this Hotel to all of our family and friends. "Even better than I thought"
I have stayed here numerous times over, the last three years and it is my favourite place in Thunder Bay to stay due to the quietness, location and service. Recently, we went to California and stayed here both the night we left and the night we returned. We asked if we could leave our vehicle for the 10 days and it was permitted free of charge and with no problem. I thought this was a great plan but we then learned that if you stay here, both going to and coming from the airport by taxi was also paid for by the hotel. This operation just keeps growing in my esteem. Always a great welcome, a good breakfast and a quiet nights sleep in comfortable beds. "Great Hotel - second time staying!" The staff are amazing; and you will get nothing but first class service. I was there for 3 days on business and they will do nothing but take care of your needs. It's a reasonable budget. Coffee machine (free) on the main floor, the internet was super fast (I run an ad agency and can attest it was trustworthy and fast). The breakfast was more than expected. Great to start your day and was included. My only issue was that I was in room 203 and it was right under the kitchen on the 3rd floor. Not the staff fault, but at 4:30am I could hear them preparing the day. Moving around upstairs doing their cleaning getting breakfast ready for 6am. By the second day I was good and managed to sleep through it. I would stay there again for sure. This is my favourite place to stay in Thunder Bay. It's close to the airport, the rooms are clean and comfortable, the staff is always pleasant, and the included breakfast is very much appreciated. They do not have an airport shuttle, but will pay for your cab if you ask at the desk. Really nice room, decent continental breakfast. Could use a few more non processed options. Staff is exceptionally friendly, even provided a taxi chit to airport! Really go out of their way for you. Would definitely stay here again. Great location close to airport. After a 9 hour drive, I was really looking forward to a much needed night's sleep. This was not to be, as the mattress was as hard as a rock and the pillows were the cheapest quality I have seen in a long time. Tossed and turned half the night. Would not stay there again. As usual, we enjoyed our stay at our home away from home. Close to many restaurants, the Airport and good access to the rest of the city. They have kept up with renovations and serve and excellent complimentary breakfast. Price is very good and the quality is perfect. This hotel is rather old but they have done some good updating and do a good job of keeping it well kept and clean. The exercise room is outdated but has everything needed. There is also a decent running trail just down the road. Lots of fast food and grocery store near by. Rooms have a fridge and microwave. The daily continental breakfast is pretty good with eggs, meat, cereals, muffins etc. There is also 2 waffle makers. Over all I was pleasantly surprised by the hotel and I would absolutely stay there again on my next trip to Thunder Bay. Very good accommodations, clean, comfortable room but the bed was a little too hard for my liking. Staff very friendly and helpful. Breakfast is good overall except the sausage, which was like not very tasty, however the bacon days made up for it. "very nice, very clean and svery friendly"
A very nice place to stay. Very comfortable and close to the airport. The staff were super friendly and accommodating. They even helped me with a minor problem that I was unaware of with my booking. Will definitely stay again when in town. "New, great location, fantastic beds"
Booked in a rush and staff were really helpful. NIce walking path right behind hotel that follows the river, through park, golf course, college grounds. Convenient to highway yet quiet. Breakfast is included and there is a fitness room. Close to new hotel and very comfortable mattresses. "Best Western Cross roads, Thunder bay"
Hotel was excellent and staff were awesome and very friendly. The breakfast was over the moon compared to what we had at other hotels along the way. I would recommend this hotel to anyone who is travelling to or through Thunder Bay. "My go to Hotel in Thunder Bay"
I stay in Thunder Bay at least three times a month and I have to say I really enjoy staying at the bests western crossroads. The front desk clerk is amazing nice and quick. There is one particular clerk Brandon I believe that even remembers my name now and takes the time to greet me while starting working my booking right away. Having a ground floor is always preferred because it is very nice to pull up and park right outside your door. The only thing I must say is that the parking lot can be a little crammed at times because it is so small. The breakfast is amazing and you can even make your own waffles with strawberry or blueberry toppings. The little desk area in the room is nice to set up a work space if you are there on business and the gym is smaller but has everything you need and never seems to be busy. The hotel is quiet you never hear noise from other rooms. Great stay, although I randomly try other hotels just to mix things up I keep coming back to this hotel. You can get adjoining rooms if needed as well. They also have pet friendly room which I have used in the past and they don't even smell Like rooms that have had pets in them!!!!! A rare find in deed!!! "Our visit to Thunder bay was to explore and relax"
Called hours ahead for a ground floor room. When we arrived front desk tried to give us a second floor room.Parking was horrible and the air conditioner rattled very loudly in room. We were booked for two nights needs upgrades to rooms and some customer service education. We usually always stay at Best Western if one is available but we're disappointed with this one. This was a quick overnight stay when driving cross country to Alberta. Check in, sleep, breakfast and get going again. Painless check in and out, standard free breakfast and comfortable bed for the night. Checked all the boxes. Had a great stay at this hotel, it's perfect for people flying. The hotel offers a great complimentary breakfast and a free taxi to the airport. Staff was friendly and helpful. Not a hotel for vacationing but perfect for frequent flyers! "Really Just An Average Place"
This is a budget minded hotel and that exactly what you get. The rooms are a little dated and the breakfast is ok but again it isn't overly expensive. We had a room at the end of the hallway - very noisy with the door slamming at all hours. Too bad if you planned to sleep in, you wouldn't! The breakfast room was on the top floor and it was bright and airy but it can get crowded as there is limited seating. The food was ok with a decent selection. Now, the Wi-Fi was terrible - could not get a good enough signal to use my VPN secured access for work. For a business traveller this is extremely important and I was told that they had just upgraded their system. I can't imagine what it was like before the upgrade. I will not stay here again when in town on business.